«Chocolate Souffle in Baklava Pouches recipe! 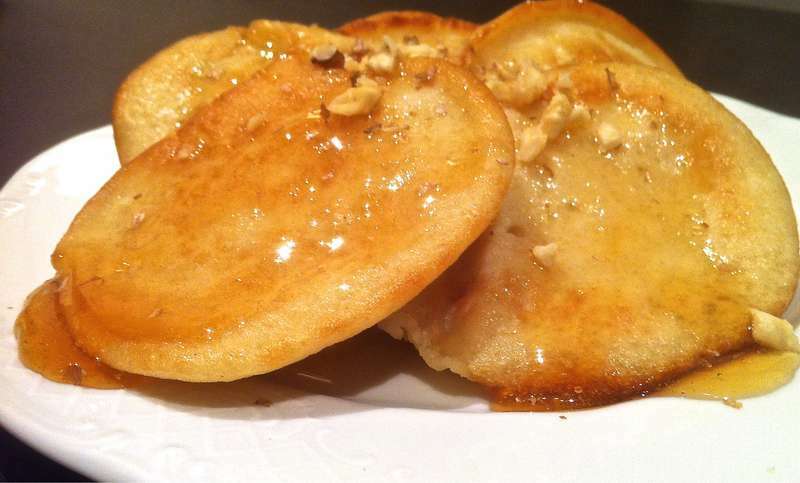 Nothing says “weekend” like the smell of homemade pancakes! Some Greeks believe the popular breakfast dish ‘tiganites’ was the first documented pancake in the world. I don’t really know if it was the first, but it surely is the easiest! Make these delicious and fluffy Greek-style pancakes (tiganites) from scratch, in less than 30 minutes with ingredients you already have. Give a Mediterranean twist with a drizzle of warm honey and sprinkle with chopped walnuts. Enjoy! Pour in a large bowl the water and yeast; stir with a fork, so that the yeast dissolves completely. Into the same bowl, add the rest of the ingredients for the pancakes and whisk to form a smooth batter. Cover with some plastic wrap and leave aside for 15-20 minutes, until the batter starts to bubble. Heat a nonstick large skillet or griddle pan over medium heat and pour in enough corn oil to cover the bottom of the pan (approx. 2 tbsps). Spoon 1-2 tbsps of the batter (depending on how large you want them) in the hot oil. Don’t overcrowd the pan; fry the pancakes in batches (3-4 at a time). Fry until nicely coloured, flipping them sides; transfer to some kitchen paper, to absorb the oil and repeat with the rest. Serve while still warm with a drizzle of warm honey and sprinkle with chopped walnuts. Enjoy! Nice, skip the dry yeast part though, not need for traditional toga notes.